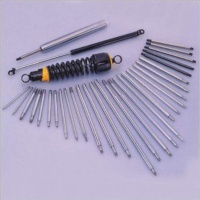 Key Specifications/Special Features: These piston rods are used for all types of shock absorbers (including adjustable models), exercise equipment, and business machine center axles, as well as for OA chair gas lifts, auto tailgate struts, and drive shafts. To meet customer specifications and special requirements, we make piston rods utilizing different processing methods based on different processing conditions. Each piston rod features an ultra-thin chrome-plated surface in range from 5um to 30um, or a surface with an S.Q. nitride penetration layer up to 12um in thickness. Surface roughness ranges from Rmax0.6um to Rmax0.2um.